The highly personalized nature of the Travel Industry makes WordPress the perfect Content Management System to choose. 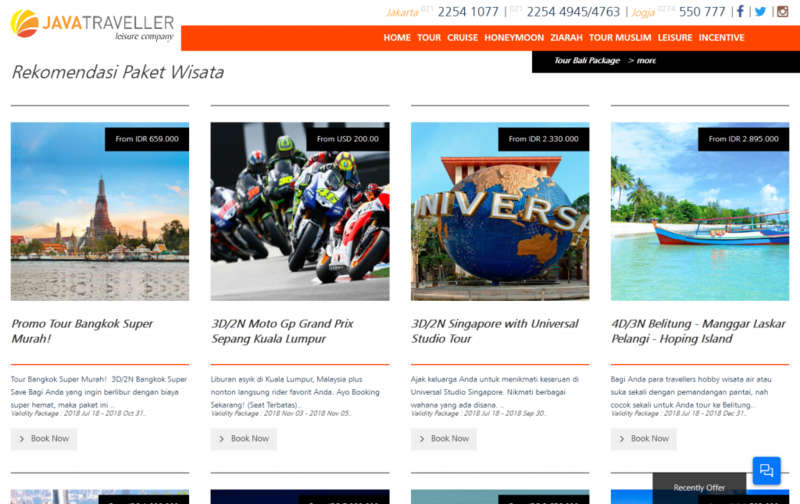 Web developer Andry Tan of Closemarketing was tasked with creating a website for Java Traveller that allows users to freely customize tour packages for Java Traveller Indonesia, PT. Java Traveller was looking to transform the level of customization that vacationers could use to tailor their online bookings. They were in the market for features such as the ability to select extra days, tour guides, add late pickups and other items, like an extra bed. This is an important factor for travel agencies who offer FIT (Fully Independent Travelers). Andry knew WordPress was flexible enough to provide all of the technical requirements while remaining a simple Content Management System with huge community to support it. However there were no plugins that did all or enough of these custom actions available. Thanks to the open architecture and experience with plugin development, Andry was able to custom develop all the requested user actions and integrate them into Java Traveller’s global pricing system. These include: twin sharing, extra bed, child not needing a bed, late pickup, upgrade options like a candlelight dinner and hiking, as well as tips from tour guides and more. Given the tremendous amount of new content required in the travel industry, WordPress enables the staff to easily add new content, trip updates, and more to meet the needs of their global customers. The resulting customization and quick ability for Java Traveller to update images and copy has enabled them to more efficiently target land tours, honeymoon trips, various cruises, general leisure trips, religious excursions, and more.